Insignia and badges worn on the various uniforms by Civil Defence services developed throughout the war. As requirements dictated, new badges were implemented to designate a person's role and rank with the various services. Badges also displayed length of service and injury / first aid awards. Whilst the more common badges are listed here, there exist unique, often locally produced badges that were created for certain borough councils and authorities (for example, the epaulette badges unique to Hampshire and Warwickshire). Regulations stipulated how and where rank and instructor badges were to be worn. The colour of badges from 1941 was to be "gold" (British Colour Council Shade No. 6). However, period photographs show a huge variance in the location of badges. 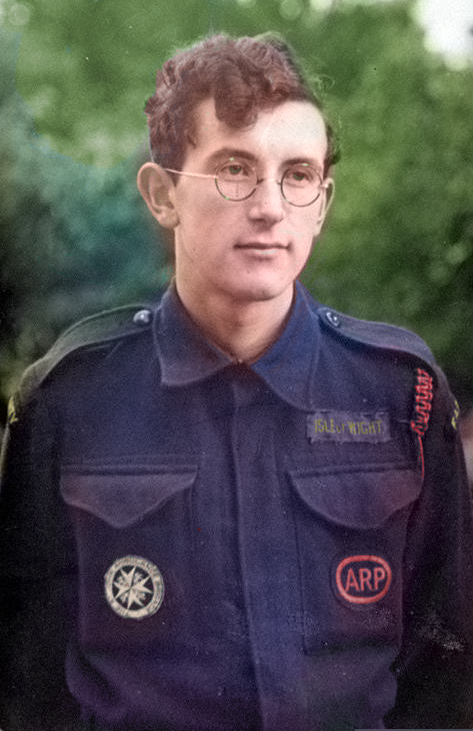 Service chevrons have been seen on both lower sleeves (regulation was lower right sleeve); although the CD breast badge was available many decided to keep their original red lettered ARP badge (and local authorities were directed to use existing stocks of ARP badges where possible) and on bluette overalls some placed their area markings above their right breast pocket; there's even a photograph of a Bomb Reconnaissance Officer who has cut down an armband to make a permanent lower sleeve badge. A key document regarding Civil Defence uniforms and badges in ARP Memo No. 17 from 1944. This booklet contains a vast amount of detail. If you would like a digital copy for a small fee please contact me. Peter Sprack - a First Aid Party member from the Isle of Wight. Wearing his CD battledress blouse with ARP breast badge, area marking and St John Ambulance award. (image © Gareth Sprack). To submit original rank insignia please send me an email via the contact page.